In the well-traveled world, there are special places people pass by everyday but have never noticed. This website is populated with many of these, places that lie hidden in plain sight as we speed by. This one is a scene from childhood, vivid in my memory but unknown to many who live there now. When I returned earlier this fall to the small town of Williams Bay, Wisconsin, on the shores of Lake Geneva where I spent the first 16 years of my life, one place I wanted to visit was a grassy bit of high ground called Vision Hill. What made this clearing in the woods special for me was not the view of Lake Geneva, mostly blocked by trees, but a small gathering place built into the hillside. There were stone terraces for sitting, and a stone podium for holding forth. I may have only visited it a few times, it being on the fringe of my childhood orbit, and have no memory of ever seeing it used, but this special place in the woods has always played on my imagination. Having been prepared to find it completely overgrown, like a Mayan ruin, or even sold off and developed, I was surprised to find the lawn still mowed, the terraces ready for an audience to gather, the podium patiently awaiting a speaker. Unappreciated in childhood was the sturdy and well-crafted stonework. It was a surprise, too, to see signs still standing, carrying a religious message that somehow hadn't registered before. My memory had secularized this place, universalized the concept of vision. Regardless of religion, a hill serves all who seek vision, insight, perspective. 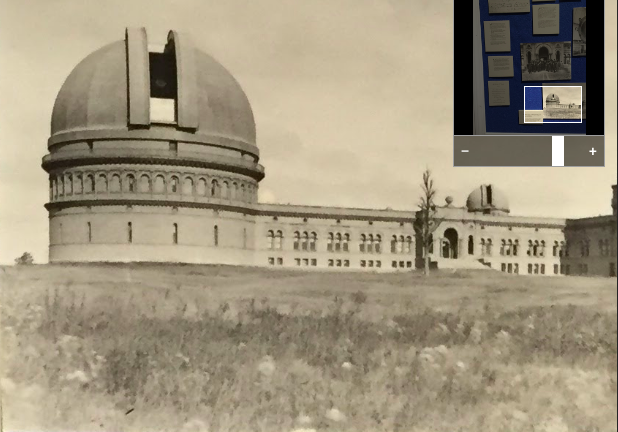 For a kid growing up next to Yerkes Observatory--a small but world-class astronomical enclave on the edge of town--religion meant getting up on a Sunday morning, putting on a skinny tie and heading down the hill into town to congregate at the Congregational Church. It was mostly my mother's idea, a legacy of her father, a minister in Ohio who, interestingly enough, also founded the chemistry department at the University of Toledo. He was a minister in the summer, an academician the rest of the year. The strong faith he must have felt seems to have become diluted in subsequent generations. I'd hear the words, read a paragraph or two in the bible I was given, but none of it stuck. When we sat on the floor in front of the Sunday school teacher and sang "Jesus loves me, this I know", I felt reassured at the possibility, but no closer to believing. During sermons, I would gaze upward at the beautiful A-frame wood ceiling, or at the louvers from which emanated the rich tones of the organ, or at the elaborately carved eagle decorating one of the lecterns. The wood and the music were real, but God remained an idea. Church service is where I discovered that my dad's passion for opera didn't translate into being able to sing. He was an astronomer, and though I didn't pick up much actual astronomy from him, I got to visit distant desert mountaintops during his observing runs. Those telescope-studded mountains too were vision hills, where people could peer deep into the universe. From my father I also gained a scientist's curiosity and openness to possibility. I didn't see much evidence to support religion's narrative, but have never fully rejected it either. Though truth has not led me resoundingly to God, it has not led me resoundingly away, either. There have been times when serendipity seemed to go beyond mere chance, to imply a state of grace. The podium, or pulpit, at Vision Hill turned out to be a perfect height for leaning forward to deliver a message, and when my congregation of two requested my CO2-We're an It sermonette, I obliged, hoping that the grandfather I never knew would have approved. Botanically, the hill doesn't much reflect the natural splendor of a creator's original vision. It would be nice to think that spring wildflowers still bloom on the hillside, but in early fall, there wasn't much beyond weedy species coating the ground beneath some walnut trees, black locust, and ash trees succumbing to Emerald Ash Borer. It was heartening to see that stiltgrass has not yet reached my home town. Nearby, on the side of the hill facing the lake, were a few wooden signs with quotes from the Bible, weathering with time like fading memories. The signs are along a path heading up the hill from what in my day was called George Williams College Camp. Stone benches were set next to the signs to expedite contemplation as the hiker gazed out over the college campus and the lake. The trail is still used, but the overgrown benches have met much the same fate as my early religious training. Ground-ivy, also known as creeping Charlie or gill-over-the-ground, now blankets much of the hill with its tiny roundish leaves, a testament to what can be achieved by a weedy ground cover's slow spread over time. Still, for anyone seeking remnants of their childhood landscape, this visit would have to be counted a great success--a sleepy hilltop improbably surviving a turbulent era, tended to and used just enough to match the memory. Better yet, I was able to show it to some of the Yerkes observatorians who live nearby but were unaware of its quiet presence just a short walk from the road. 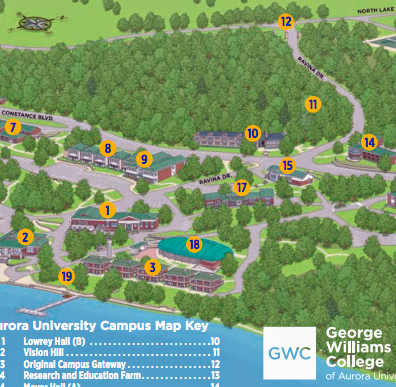 The college's website includes a map showing its location (#11), with a short description of the walk leading up the hill. Interesting in the description that there was a "head for the hills" element in the origins of the outdoor chapel on Vision Hill--an escape from the racket of the motorboats on the lake. Here was a point of unity between the religious and secular worlds. Whether it was an astronomer peering into the sky, or a worshipper seeking communion of a spiritual sort, both of these activities depend on a lack of interference, be it light pollution or noise pollution. "Another path leads to Vision Hill, once called “Inspiration Hill,” which was purchased in 1906. It was originally used as a place of worship when lakeside services became interrupted by the sounds of motor boats on Geneva Lake (one worshipper actually caught a fish during a service)." Turn a photo of a woodland pond upside down, and it almost looks like the leaves are still on the tall trees reflected in the water. Sweetgum, pin oak, and black birch all are represented in the leaves below and the trees above. A fallen black birch sprawls across the water. If the trees around this pond could look down, they would see their fate in their reflections. While reading a eulogy from 1935 found online, I realized that I had spent much of my childhood living inside the minds of some pretty famous visionaries. There were three I know of thus far, whose realized visions framed my world. One was George Ellery Hale, founder of Yerkes Observatory, the iconic 1895 building where my father worked. Another was John Charles Olmsted--nephew and adopted son of famed landscape architect Frederick Law Olmsted--and designer of the grounds of the observatory. Those grounds served as my very expansive and semi-public front yard. But the person being eulogized, and the subject of this post, was a prominent astronomer of the early 20th century named Edwin Brant Frost. 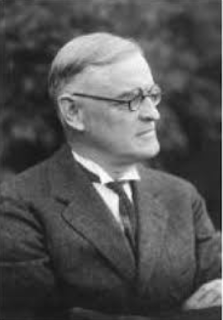 He was director of the observatory from 1905 to 1932, and editor of the Astrophysical Journal. He was also the man whose love of nature brought into being my childhood landscape, and after a youth spent roaming that broad expanse of lawns, trees, and sidewalks surrounding Yerkes Observatory, my mind seems to have continued down pathways of thought similar to his. As an astronomer first and foremost, his head was up in the stars, but he was also a renaissance man who tracked the arrivals and departures of birds, loved music and singing, played sports. He was, for my childhood world, a hidden figure parallel in many ways to my "adopted ancestor" of sorts, Oswald Veblen, who in Princeton had long ago formed a link between the high intellectual pursuits of mathematics and physics, and the beloved natural world we experience during a walk in the woods. 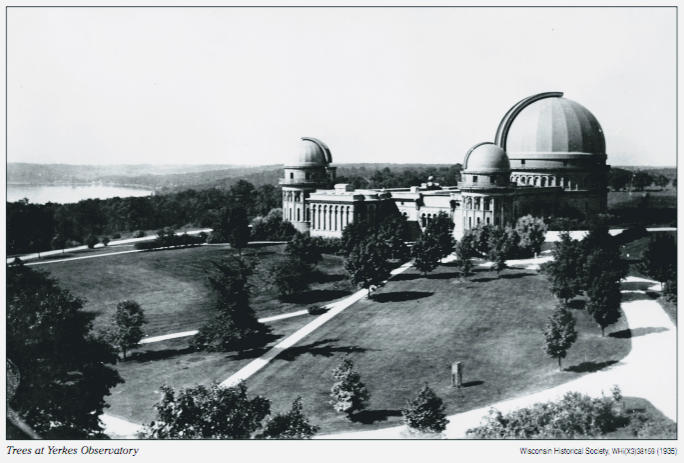 Though it was Hale who in the 1890s conceived of and found funding for Yerkes Observatory, he soon moved on to other projects, leaving Frost to lead the institution for the next 30 years. At that point, the observatory was "out standing in its field," as they say, surrounded by what in this photo appears to be Wisconsin prairie. Frost loved trees, however, and so hired the Olmsted firm to create a design for the grounds. Strange, to learn as an adult that my childhood landscape was designed by Olmsteds, but there it is, seen from above, looking like a giant horseshoe crab with the domes of telescopes for eyes. These are the roads and paths I walked to school, and where my father taught me to drive. Along them lived astronomers like Chandrasekhar, who won the Nobel prize, Bill Morgan, Nelson Limber, and my father, Al Hiltner. With a long list of trees from many continents, my childhood landscape, unbeknownst to me at the time, was an arboretum of sorts, with some trees having grown to be "state records" for their species. To a kid who, like Frost, took to sports, the grounds were primarily a place to play pickup games of volleyball, football, or baseball, or launch Estes rockets. As I tested my skill as a golfer, seeing how many shots it took to hit a ball all the way around the building, the trees were challenging obstructions to hit the ball over or around. The working class golf course next to Yerkes, where I spent summers seeking and only once achieving an under par round, turns out to have been Frost's idea as well. Our astronomical enclave was perched on the outskirts of little Williams Bay, Wisconsin, chosen by the University of Chicago because of its littleness, as a place where telescopes would not be hindered by city lights and pollution. Despite the town's small size, there was also a handy railroad that came into town and could carry students and faculty back and forth to Chicago. It was in some ways reminiscent of the Institute for Advanced Study's location on the edge of Princeton, thirty years later. My path into town for school each day included a wooded path called "Frost's Trail." 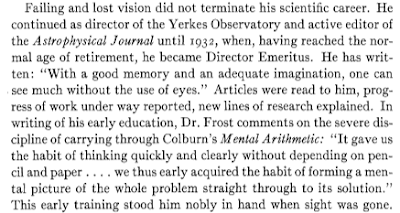 In his 50s, Frost lost the use of one eye, then the other, which normally would be catastrophic for an astronomer. Yet with the help of his wife and observatory staff he continued on as Yerkes director and editor of the Astrophysical Journal. A wire was strung from tree to tree along the wooded trail so that, with the help of a cane to wrap around the wire, he could find his way to work. Walking that path thirty years later, I would see bits of the long-since rusted wire, and imagine Frost having walked there, experiencing nature by its smell and touch. In my child's mind, I somehow conflated Edwin Frost the astronomer with Robert Frost the poet. They both liked to botanize. Both were beloved figures. Both had the northeast in their bones. Edwin Frost's wife wrote poetry. So I wasn't too far off. Most of the extraordinary people we know who are blind are musicians--Stevie Wonder, Ray Charles--certainly no one in as sight-dependent a field as astronomy. And yet in our era, so saturated with rich digital imagery, it is uncanny to learn that Frost not only coped but thrived without sight. In part due to having learned to do math in his head, he was able to visualize the world he could no longer see. The dominance of sight causes so much to go unnoticed. Frost kept records of the arrivals and departures of migratory birds, and even came up with a formula to predict the rate of a cricket's chirp related to temperature. I made a brief return to Williams Bay in the 1970s, and remember walking Frost's trail one spring day when the woods was alive with birdsong, easily enough to fill one's mind with beauty without the aid of sight. One of the songs reminded me of a riff Charlie Parker often used to end his phrases. Here's something lost from our culture, as people's lives become more urban--the notion that character is rooted in the land. A nice expression of love for open spaces. Standing on the shores of Lake Geneva this past September, just down a path from the observatory, the lake relieved of the burden of tourists and motorboats that crowd it in the summer, I felt that extraordinary calm, with silence extending out in all directions. 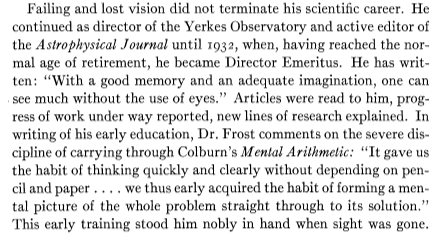 This passage depicts Frost the astronomer almost as a rock star, conceivable in the early 1930s, when science and technology offered promise of a way out of the Great Depression and into an exciting new world. To demonstrate the wonders of new technologies like the photo cell, Frost conceived of using the light of the star Arcturus to trigger the lighting of the Worlds Fair on opening night. Arcturus being about 40 light years away, the light reaching Earth from the star would have just been leaving it 40 years earlier when Chicago had a previous Worlds Fair. At the appointed moment, the lights came on and the crowd went wild. Frost was celebrated for this poetic application of technology, then returned to the comforting open spaces and dark nights of Williams Bay two hours north. Since the closing of Yerkes Observatory on October 1 this fall, after 120 years of operation, my childhood landscape is in suspended animation. The grass is still mowed, the telescopes still exercised periodically but closed off from public view. The vision of Frost and others was a good one, but now awaits another.